We invited friends over for brunch today. Nothing fancy: bloody Marys (nothing but Tabasco branch b/m mix), soft scrambled eggs, Farmer John breakfast sausages, toasted English muffins served with raspberry jam and my homemade mango-lime perserves, and chocolate marble cake for dessert. The cake recipe I got the other day from bakingsheet. This cake came together easily. The print font was a little small for me, and I did not see the 1/4 cup water to be added to the chocolate batter to thin it out a bit, but the cake came out fine without it. 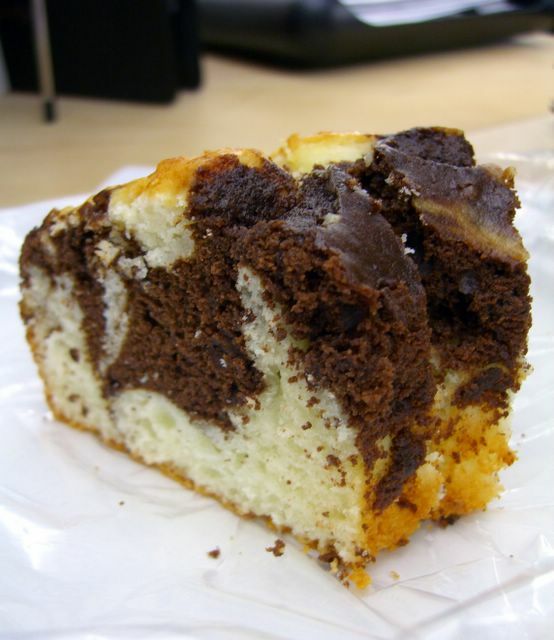 I have to admit I've swiped bakingsheet's photo, but the cake got eaten up before I could take one of my own. Breakfast was served outside by the pool under the overhang, but it did start to get rather toasty warm, probably mid-80s by the time we finished. By later afternoon, it had reached 95 degrees and we finally had to switch on the swamp cooler. Well, I guess our cooler spring temps are gone for this year. 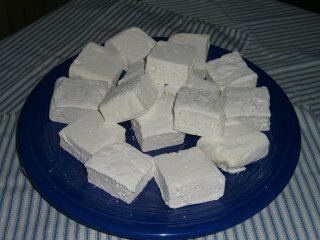 I saw this recipe on Brownie Point's blog for marshmallows yesterday. I wanted to make them right away, but a weekend houseguest from Palo Alto was due to arrive any minute. Not wanting to wait, I dove right in and got everything together so I could whip them up later. Well, he got lost somewhere on the L.A. freeways and was late, which gave me just enough time to mix them up. These were a breeze to make. Just keep in mind you're working with sugar as hot as a volcano, and follow a few safety rules, and you'll do fine. This recipe conveniently has amounts for a 13 x 9 pan and also an 8 x 8 pan; I made the smaller amount, because a large pan of marshmallows seemed like an awful lot. While the gelatin blooms in water and vanilla extract, I proceeded to cook the sugar, water, corn syrup mixture to the soft ball stage. With the mixer on low speed the hot solution is to be poured slowly down the side of the mixer bowl. Well, I've always found this to be risky, so ahead of time I heated a 4-cup Pyrex measuring cup and poured the hot liquid into it, which was then easier to aim and pour down into the bowl. It's then mixed at high speed about 10 minutes, at which point you pour it into a parchment-lined pan and smooth out the top with an offset spatula. Then it's is set aside, uncovered, overnight to dry out. One of the best recent purchases we've made was a small offset spatula from Kitchen Kitchen in Indian Wells. This is great for smoothing out the top of batters in smaller sized pans. This morning I dusted the top with equal amounts of rice flour and powdered sugar, turned the slab out, peeled off the paper, dusted the bottom, cut it into squares and dusted the rest of the exposed sides. This could not have been easier. We all had one after breakfast. YUMMY! I can't wait to try this with other flavors instead of the vanilla. Let's see: how about Kahlua or Grand Marnier flavored marshmallows? Can you imagine a S'mores made with good dark chocolate, orange flavored marshmallow and Graham crackers? Wow! What a sugar rush that's going to be. Four of us drove up to Joshua Tree National Park this morning, which is only about 50 miles from Palm Springs. It's a different world up there, like being on the moon. Instead of messing with a main course and sides, we decided to buy the main course and make the sides. The fried chicken from Stater Brothers market was really excellent, and we'd definitely buy it again. Not greasy, and it held up even after sitting in the cooler for several hours. Place bulgur in bowl and add about 3 cups cool water. Soak for at least 3 or 4 hours, as long as overnight. Meanwhile, coarseley chop the mint and parsley together, for a total of about 1 cup. Drain the bulgur in a sieve for about 30 minutes, until fluffy and dried. Place the drained bulgur in a bowl and add the remaining ingredients and mix well. Serve at room temperature. Tastes better the next day. Taste then for re-seasoning. Combine honey, orange rind, orange juice and Grand Marnier in bowl large enough to hold melon and strawberries. Add both fruits and toss. Refrigerate until serving time, up to 6 hours ahead. Both recipes are from Jacques Pepin's Kitchen, Cooking with Claudine. For dessert, I made Joe's Chocolate-Banana Snack Cake, and it really was great for a picnic. Not too sweet, it traveled well, and it could be made the day before and improves with time. Excellent for using up those frozen bananas. Rummaging through the freezer this morning, I came across a loaf of La Brea Bakery Roasted Garlic Bread which we found on the day-old rack at Stater Brothers the other day. I'd been wanting to try Mario Batali's recipe for pancotto, and this seemed like the right time. All that was needed from the store was a pound of fennel and mint. Well, no surprise, Albertson's had no mint, so I went ahead without it, and the end result was very fine. Here's an excerpt from e-rcps.com about pancotto. The recipe is begun by sweating/sauteeing diced fennel, sliced garlic, raisins and two dried chili peppers, left whole. This took ten minutes or so on medium heat, watching carefully that the garlic didn't burn. 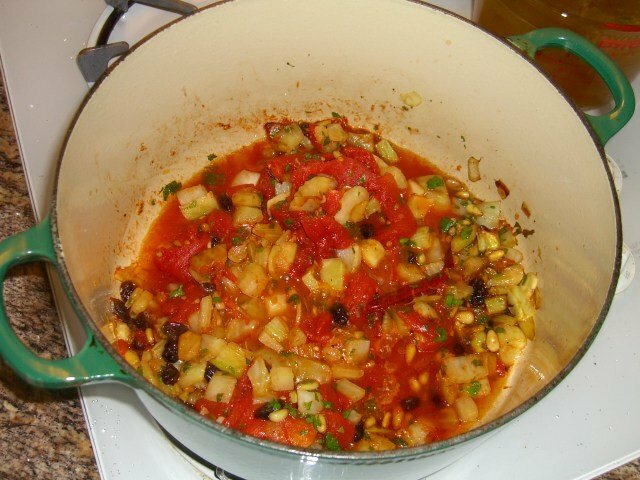 Next came the addition of chopped parsley, canned tomatoes, and toasted pine nuts; this was left to simmer for 25 minutes. Six cups of the final leftover saffron chicken broth was added. At this point, I just took it off the burner and held it until dinner time. When we were ready to eat, I returned the pot to the burner and brought it to a boil and added two handfuls of the cubed roasted garlic bread. The bread thickened the soup and was ready to serve up. The only thing needed was a drizzle of olive oil. As if that wasn't enough bread, we toasted some thick slices of the bread and topped it lots of great things: goat cheese and homemade pickled beets and onions; goat cheese and leftover roasted bell peppers; butter and thinly sliced tomatoes. To go with all of this we had a nice cabernet-merlot from Eola Hills Oregon vineyards, best served slightly cooler than room themperature. Go here for Wine Spectator Online. It's a great site with lots of cool stuff about wine. Review of the recipe: This was a keeper because it was extremely easy to prepare, it was economical, it's make-ahead, and there's a huge flavor payoff. Lots of flavors going on at the same time: the sweet fennel, the tomatoes, the sweet from the raisins and the bread. This also had a nice heat kick from the peppers. Definitely will make this again. 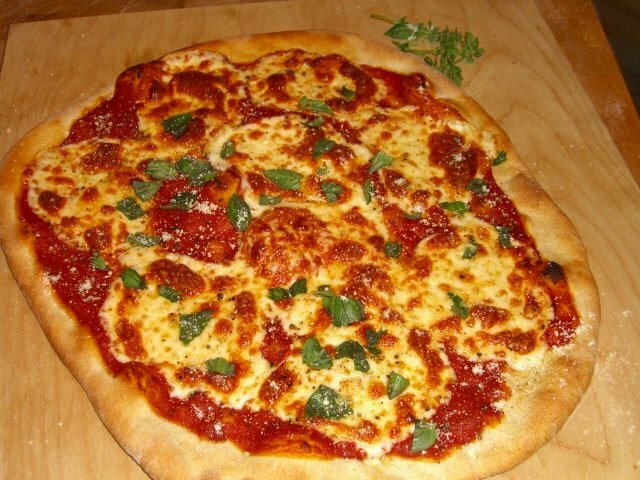 Tonight we're making pizza, using Tyler Florence's "ultimate" recipe, with a few alterations. I doubled the recipe, replacing part of the all-purpose flour with rye flour for a bit more structure, halved it after the first rise, froze one half and chilled the other until we were ready to bake it. Our local Ralph's market at Smoketree Center did not have fresh yeast, nor fresh mozzarella (when will Palm Springs markets catch up with the 21st century? ); so we just used our regular active dry yeast and will shred whole milk mozzarella. For the sauce, I had some leftover tomato puree and some canned diced tomatoes. To that I added a couple of sliced garlic cloves, dried basil and oregano, salt, some water and two dried peperoncini. This was brought to a simmer and allowd to reduce, uncovered, at which time I extracted the peppers and pureed the mixture in the blender and returned it to the saucepan. It was a bit tart, so I added a healthy pinch of sugar to mellow it out. I left the pan on the lowest setting and allowed it to reduce further to a nice "saucey" and spreadable consistency for a pizza. Instead of shredding the cheese, I think we'll try thinly slicing it so each bit will contain a nice glob of gooey cheese. When the pizza comes out of the oven, I plan on scattering it with fresh basil from the garden. BTY: "garden" is an overstatement. There is a basil plant, two tomato plants recently planted and a healthy rosemary bush. Anything we can grow in the desert is a welcome addition. For those of you who live elsewhere, you cannot imagine how different the growing season is here. Take what you do and reverse it. What grows for you in summer, grows here in winter, and vice versa. Get the picture? It's HOT here in the summer! Starting very soon, the daily high temperatures will not be below 105 degrees until about late September. But I digress. To go with the pizza we are having a Blackstone 2003 Napa Valley Merlot. The afternoon winds have died down, the temperature is very agreeable, so I think we'll eat outside. 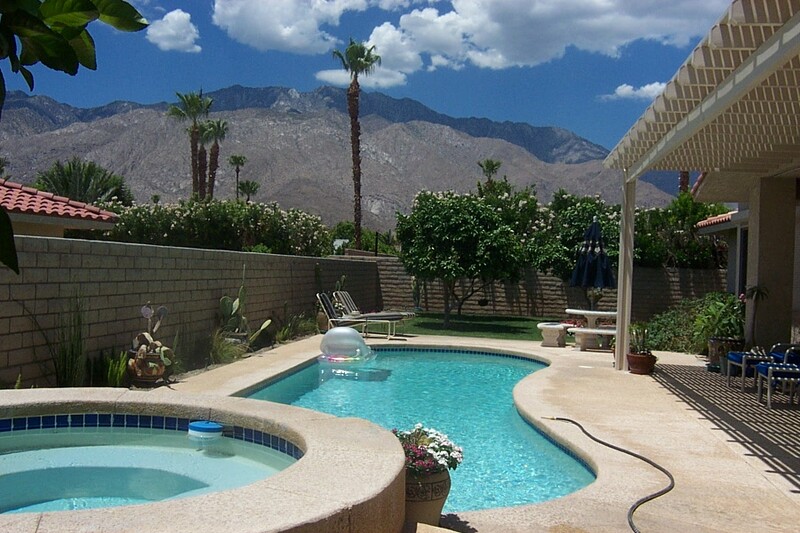 Here is a picture of our beautiful view of the San Jacinto mountains. Wow! The pizza was fantastic, not too thin with a nice chewy texture without being bready. The addition of the rye flour was just right. Although the part-skim mozzarella was really good, I can't help but wonder how much better the pizza would have been had the fresh been available. Also, half off the dough was plenty for two servings, and the rest we'll have tomorrow or Monday. With the leftover saffron chicken broth from last week, I had the idea to make an excellent risotto for dinner. 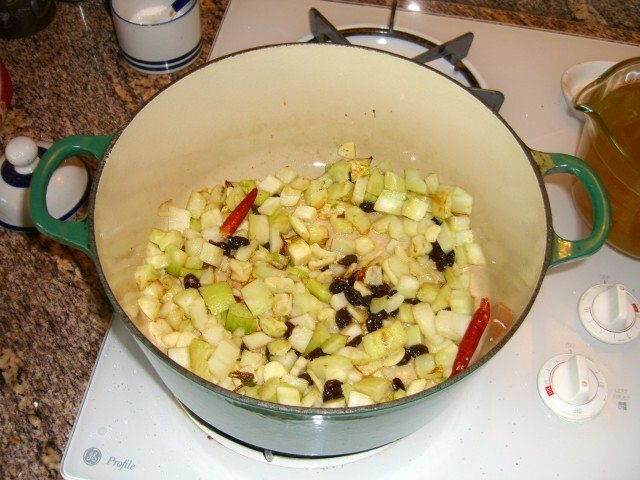 As with all risottos, the broth was brought to a simmer and held for additions to the rice. I sauteed half a minced onion in olive oil. One cup of arborio rice was added at the point the onion was translucent and was sauteed for another few minutes. 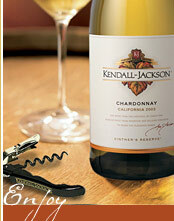 Eddie had opened a bottle of Kendall Jackson Estate Chardonnay, so I added a half cup or so of that to the rice. Over medium heat, I started stirring frequently until the wine was nearly all evaporated. At that stage, I started adding the broth by ladleful and continued stirring. More broth was added at the stage where most of the broth had been absorbed by the rice. Estimating, I'd say about 4 cups of so of broth were needed. When the rice was cooked by still slightly al dente, I added the last bit of broth and allowed it to cook down a bit. Then a knob of butter and a couple tablespoons of cream were added, along with salt and pepper to taste. Also, I threw in about a cup of thawed frozen peas. To finish it off, I grated some fresh Reggiano Parmesano atop and served. Cold sliced grilled chicken breasts were a nice accompaniment; but the rice as the main event. And the chardonnay went well with everything. For dessert, Eddie had macerated frozen strawberries with some sugar and topped them with sweetened whipped cream, served on top of a square of his famous Scottish shortbread. Last night we had company, and since it had been so nice and warm, and the winds had abated, we chanced having dinner outside by the pool. Well, all went well, and we weren't blown away with the usual 7 p.m. winds. Springtime usually means wind, and this year has been no exception. 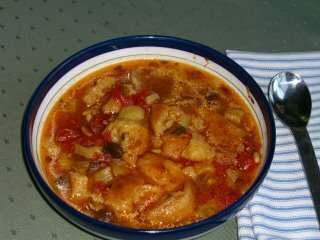 For starters we had my adaptation of the South Beach Diet gazpacho. It's easy to fix, we usually have most of the ingredients on hand, and it can be changed according to what's in the pantry and fridge. It can be made way ahead and actually improves with some aging. Here's the recipe with noted changes. Combine all ingredients in blender. Blend well. Chill. Serve with a grinding of freshly ground black pepper and a drizzle of extra virgin Spanish olive oil. Changes: Substituted 1 cup of the tomato juice with Tabasco brand bloody mary mix. Used 1 seeded serrano chile. We served the entree and sides buffet style from the kitchen counter. Grilled chicken breast halves with bones attached, Martha Stewart's version of macaroni and cheese, and grilled vegetables. The chicken was brined for about an hour in a standard brine of 1 quart water, a cup of kosher salt and 1/2 cup sugar. The grilled vegetables consisted of eggplant, zucchini, Roma tomatoes, scallions, and red and green bell peppers. Here's the recipe for the mac and cheese. I've made this lots of times and there's always leftovers which freeze well for a good desperation dinner. You can easily divide this recipe in half: Use a 1 1/2-quart casserole dish. 1. Heat oven to 375°. Rub 3-quart casserole dish with halved garlic clove. Butter a 3-quart casserole dish; set aside. Place bread in a medium bowl. In a small saucepan over medium heat, melt 2 tablespoons butter. Pour butter into bowl with bread, and toss. Set breadcrumbs aside. 2. In a medium saucepan set over medium heat, heat milk. Melt remaining 6 tablespoons butter in a high-sided skillet over medium heat. When butter bubbles, add flour. Cook, whisking, 1 minute. 3. While whisking, slowly pour in hot milk. Continue cooking, whisking constantly, until the mixture bubbles and becomes thick. 4. Remove pan from heat. Strain out optional ingredients. Stir in salt, nutmeg, black pepper, cayenne pepper, 3 cups cheddar cheese, and 1 1/2 cups Gruyère or 1 cup Pecorino Romano; set cheese sauce aside. 6. Pour mixture into prepared dish. Sprinkle remaining 1 1/2 cups cheddar cheese, 1/2 cup Gruyère or 1/4 cup Pecorino Romano, and breadcrumbs over top. Bake until browned on top, about 30 minutes. Transfer dish to a wire rack to cool 5 minutes; serve hot. For dessert, Eddie made his puff pastry shells filled with raspberry jam and sweetened whipped cream. Yummy! We've had a busy calendar the last couple of days, so no cooking has taken place here. But, the best part of cooking is leftovers. Cook once, eat 2 or more times. I love that part. And usually, food tastes better the second time around. Here's a picture of our doggies. 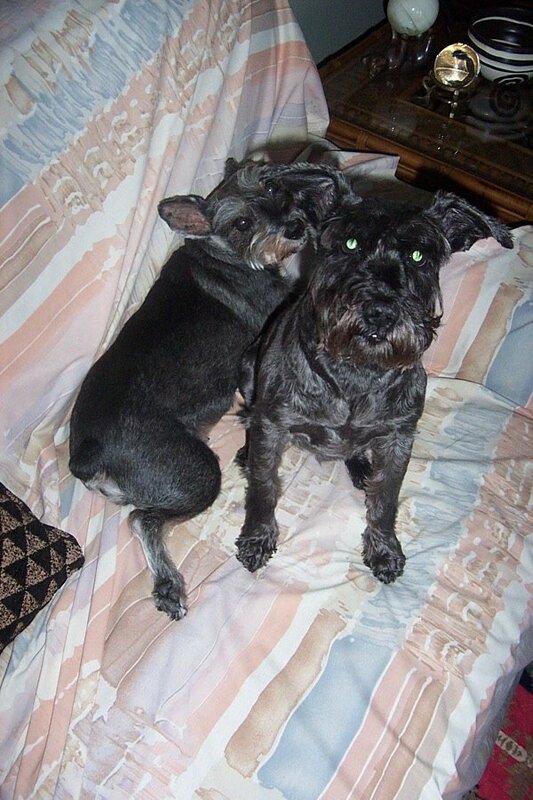 Oprah, the darker one, was put down two months ago, which leaves Demi by himself. Well, last night's dinner was a real success! We started with Eddie's Scottish sausage rolls which were great, as usual. Everyone begs him for the recipe, but he makes it all by "feel" and finds it difficult to convey the method and amounts, although it's simply made from rolled-out puff pastry, ground pork, chopped onions, salt and pepper. Simple, huh? But he has a certain way of making them, just perfect size for an appetizer. The saffron chicken broth with spinach matzo balls was by far the best I've ever made. The broth was super-easy to make. The matzo ball dough was a breeze also. Best of all, it all could be made a day ahead and just reheated at time of service. This is a real winner of a recipe and I'll be making it again. The sweet and sour brisket also was made a day ahead. The afternoon before dinner, I sliced the meat, placed it in a nice serving/baking dish, smothered it with the onion sauce, covered it and warmed it for an hour in a 300 oven. Wow! Yummy! Barefoot Contessa's caramelized shallots were a huge hit. I just served them right from the pan they were made in, which gave them a nice right-out-of-the-oven look, with the sides of the pan nicely browned from all the buttery sugar and vinegar mixture. I made two half sheet pans of roasted new potatoes ahead of time and reheated them in the same 400 degree oven as the shallots finished in. The maple-walnut espresso torte came out really well. The sweet and spicy simple-syrup sauce that went with it was a great complement. There's enough left over to sweeten a batch of home-brewed iced tea. Can't wait! Well, Passover begins tomorrow at sundown, and we're having neighbors over for a nontraditional dinner which will include some passover items, but not an all-out seder. I'm nonobservant, Eddie was raised protestant in Scotland; so we don't go overboard. I'm pretty sure most of the guys coming over tomorrow haven't had matzo ball soup, so I've already started making that yesterday and mixed up the matzo ball dough this morning and am letting it rest for a few hours before cooking them up. 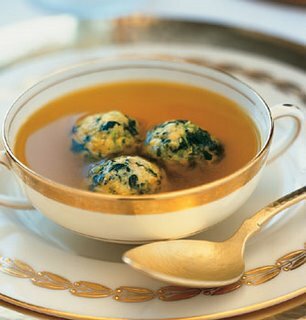 The recipe I'm using is new to me -- SAFFRON CHICKEN BROTH WITH SPINACH MATZO BALLS -- but I'm usually adventurous when it comes to cooking new things for company and it looked good in the magazine. The ingredients were readily available, including a tray of chicken wings from Sam's Club, onions, saffron from the home pantry, and just plain water. Very easy and the aroma is out of this world. Saved the chicken meat, part of which went into the dough for the matzo balls. Also, spinach is included in the dough, which gives them a nice green speckled appearance. Just as an aside, I think the saffron broth by itself would be spectacular if used in a risotto. I'll have to try that soon. Also, the leftover chicken meat will make a nice chicken salad sandwich. Also on the menu are Sweet-and-Sour Brisket with Shallots and New Potatoes and Maple-Walnut Espresso Torte for dessert. I am modifying the brisket recipe as follows: instead of brasing them with the brisket, I plan to caramelize the shallots, a la Barefoot Contessa, and roast the new potatoes by themselves. The meat, potatoes, shallots and gravy will all be served together on a platter, and everyone can help themselves. Thanks to Epicurious.com for this year's Passover menu. They always come through for me. Love the reader comments too. That's it for now. Will let you know Thursday or so how it all comes out. Well, the other day I had a hankering for chocolate cake, so I went through my list of recipes to try out and chose Eating Well magazine's Died and Gone to Heaven Chocolate Cake. It was a breeze to throw together and turned out great. In fact, it's been sitting covered on the counter for a few days now, and it just keeps getting better. Nice and moist, fine crumb and not too sweet. I got nervous about it going off, so I cut it into serving sized slices and froze the remaining half cake for the future. This will go really well, frozen and sliced in half, with a scoop of soften vanilla ice cream. Can't wait until I need a dessert and find it all ready to go! Yummy! I recommend this cake because it safisfies your chocolate craving, but it's not cloyingly sweet or chocolatey. One change I made: In the icing, I added a bit or orange extract because the plain icing was too sugary and intense. Also, chocolate and orange are a great combo. Next time, I may add some orange liquer to the batter and see how that goes. Hey, cake and booze -- what's not to like? Technical note: have everything at or near room temperature; e.g., the buttermilk and eggs, etc. Enjoy! And let us know how yours turns out. Originally featured in EatingWell's "Rx for Recipes" column and on CNN's "On the Menu" program, this foolproof cake has turned out to be one of EL's most popular recipes. Dutch-process cocoa is preferred here for its deep chocolate flavor. Preheat oven to 350 degrees F. Lightly oil a 12-cup Bundt pan or coat it with nonstick cooking spray. Dust the pan with flour, invert and shake out the excess. To make icing: In a small bowl, whisk together confectioners’ sugar, vanilla and enough of the buttermilk or milk to make a thick but pourable icing. Set the cake on a serving plate and drizzle the icing over the top. 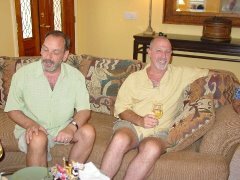 My name is Harry and my partner Eddie and I live in Palm Springs, CA. I'm a hopeless foodie and have been for years. My last career ended in a hand disability and I went to the California Culinary Academy in 1995 for 16 months and graduated in April of 1996. 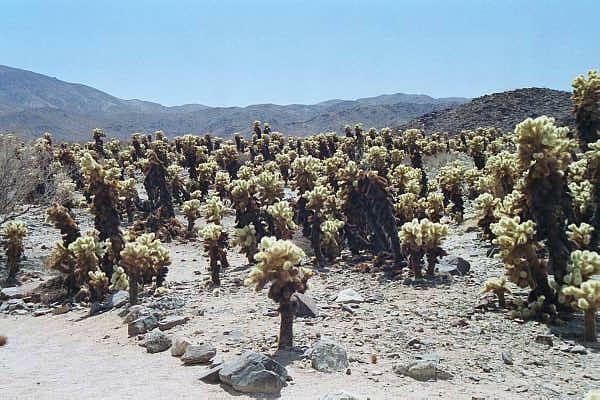 Shortly thereafter we moved to the desert. Quickly, regretably, we found the desert to be just that, a culinary desert, with none of the fabulous food finds and amenities available in the Bay Area. That said, we love it here and would never entertain the idea of moving back up north. Foodwise, things have improved over the last ten years here -- some better places to shop, a bit more variety in the grocery stores and more restaurants. Along with the huge migration to the desert has followed a lot of the big-city attitudes and snobbishness we hoped we had left behind in San Francisco. I have enjoyed following many of your blogs recently and hope to contribute now and then some of our recipes, good and bad, as the case may be. But ultimately we hope to have some fun with this new form of communcation.